Watch this step-by-step demonstration and learn how to set a multi-state USB 2.0 complex match and trigger an external output with the Beagle USB 5000 v2 SuperSpeed Protocol Analyzer! Working with SPI? Learn how to program a 4 MB SPI Serial Flash memory chip using the Cheetah SPI Host Adapter and free Flash Center Software. Save Up to $500 Off USB, I2C, SPI, and CAN Tools today! Time is running out. Only 21 days left to take advantage of the lowest prices of the year from Total Phase for USB, I2C, SPI, and CAN developer debugging tools. For more information on this special promotion, please visit our website and start saving today! Our international distributors are also offering the same year-end promotion! Below is a list of the following distributors along with their respective geographies. If interested in taking advantage of this special promotion in your location, click on the distributor link and you will be taken to their website. Enter the BeagleBone Cape Design Contest! 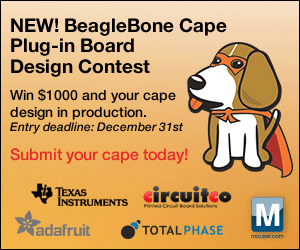 Total Phase is proud to sponsor the BeagleBone Cape Plug-In Board Design Contest, hosted by BeagleBoard .org. As part of our sponsorship, Total Phase is giving away free tools from our USB, I2C, SPI, and CAN suite for the BeagleBone Cape Contest's weekly trivia contest! Participants do not have to submit an entry into the design contest to participate in the weekly trivia contest. Each week, BeagleBoard .org will post a new trivia question and one winner will be selected from the responses to receive a prize from one of the BeagleBone Cape Contest sponsors. Check out the weekly trivia questions here! Total Phase has already given away one Aardvark I2C/SPI Host Adapter to Umakanta Patro. Congratulations Umakanta! Also, don't forget to submit your entries for the BeagleBone Cape Plug-In Board Design Contest by December 31, 2012! Judging of entries will occur from January 7-11, 2013 and winners will be announced January 14, 2013. For more information and details, please visit here. We recently sponsored hands-on training at two major tradeshows -- the Renesas Developers' Conference in Anaheim, CA and ARM TechCon in Santa Clara, CA. Classes featured tools from Total Phase's award-winning suite. The Beagle USB 480 Protocol Analyzer, Aardvark I2C/SPI Host Adapter, and Beagle I2C/SPI Protocl Analyzer enabled attendees to experience firsthand the real-time capabilities of our protocol analyzers and host adapters in solving debugging problems at the Renesas DevCon . The session was titled, "Using Embedded Tools for I2C, SPI, and USB Debugging for the Renesas RX63N RDK" and was taught by our very own Scott Loring (pictured left), Engineering Manager at Total Phase! At the ARM TechCon , NXP implemented the Beagle USB 480 Protocol Analyzer into their USB session entitled, "Making USB Easy." 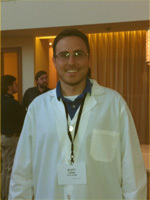 Total Phase also raffled off a free Beagle USB 480 Protocol Analyzer to the class attendees. Coming Soon: New Beagle Protocol Analyzer for RS232/UART! Many of you have told us you wanted to sniff RS232/UART, only to find no simple hardware based tool to fit your needs. The wait is almost over – we are excited to announce a brand new Beagle protocol analyzer has been designed for UART and RS-232! We are always looking for ways to expand our suite of development tools as well as the monitoring capabilities of our award-winning Data Center Software. Since 2009, Data Center Software has provided engineers with true real-time monitoring and analysis for USB. I2C, SPI, and CAN traffic. Now, after hearing your feedback, we are happy to announce that the Data Center Software will soon support the UART and RS-232 protocols! Total Phase engineers are hard at work on the new Beagle protocol analyzer for UART and RS-232, and we are expecting it to arrive early next year (2013). 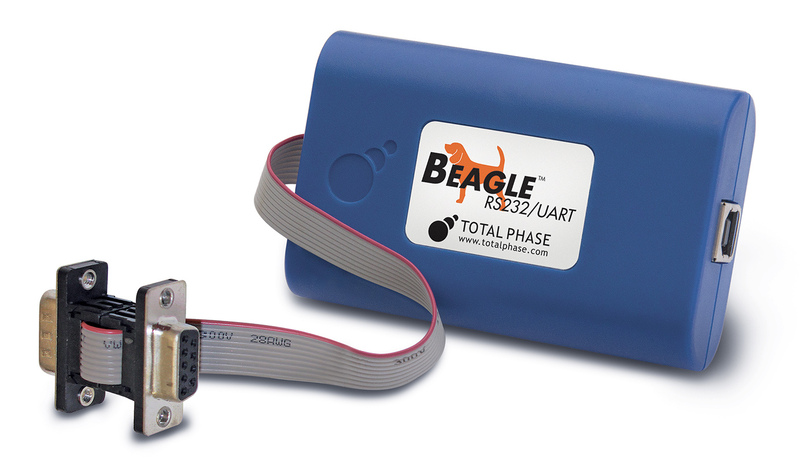 If you have any suggestions for features on the Beagle analyzer for UART and RS-232, please email us at sales@totalphase.com or call us at (408) 850-6501. 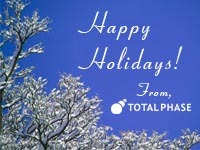 Total Phase will be closed from Monday, December 24 to Friday, December 28 for the holiday break. Any orders placed during this week will be processed and shipped on Monday, December 31. Total Phase will resume normal business hours on Monday, December 31. Happy holidays! We used the Cheetah SPI Host Adapter in a production test environment to program the Flash chip with data. The Cheetah adapter is not only a powerful tool but also extremely convenient to use because of the user-friendly Flash Center Software. It saved us a lot of time that would've been needed to write our own scripts for Flash programming. We were even able to create custom XML files for parts not listed thanks to Total Phase's support team!